Chux The Marketeer | These are my thoughts, insights and opinions into the world of marketing. Get involved, talk to me and share! Privacy. What does it mean to you? At its basic level, privacy is “the ability of an individual or group to seclude themselves or information about themselves and thereby express themselves selectively”. Universal and understood across different cultures and boundaries, you would think that people’s privacy would be respected and upheld by those who hold information provided to them. However, there has been recent scandals around privacy and personal information. Facebook were in the news recently about their “experiments” and how they manipulated news feeds to what expressions of emotions users saw. Other stories around personal privacy include the phone hacking scandal involving journalists and editors at the News of the World newspaper and lest we forget the Snowden revelations of NSA activities last year, which still has an impact to this very day. There are many more stories related to privacy concerns and how it’s handled, which could go on for a very long time, but where does privacy leave us? Google have recently launched a service that enables EU residents to request that their details are removed from their search results. Now Google is the largest search engine compared to its rivals Yahoo! and Bing, meaning that there’s a likelihood you’re not going to appear in searches made by others. What is interesting is, will there come a point where more and more companies that handle data see this as an opportunity to cash in on an individual’s privacy? After all, we’re only as good as the information we give to these companies, so there has to be a trade-off, so in essence an individual’s demand for privacy depends on how much of themselves they supply online or elsewhere. If there is a market for privacy, who would be the main customers? The wealthy? The powerful? Regular people? How would companies charge? On a subscription basis? A one-off payment? Privacy credits? Will privacy cease to exist in the next two decades? So many questions, but no one answer is black and white. This entry was posted in Internet, Social Media, Trends on July 15, 2014 by Chux. 1 Wrong That I Want To Write About…. I’ve decided that I need to write more and make it a habit. My limited blog posts are something which I need to address over the coming year, so to help me get into the habit, I am dedicating 20 minutes per day this January to writing. Whether I have something to say, or nothing at all or if I get bored, I will be writing. This is definitely one wrong that I want to write about. This entry was posted in Social Media and tagged blogging, Copyblogger, habits, New Year, Writing on January 1, 2014 by Chux. A great read from 18 for the world’s wealthiest. What are your thoughts? This entry was posted in Marketing Communication and tagged business, Entrepreneurship, Insights, Life Lessons, Riches, Wealth on October 9, 2013 by Chux. The path to loyalty between a customer and brand is one that can either be a short walk up the road until you see the bus to reach another destination, or one which you continue walking together, getting stronger along the way and understanding more about each other and what they stand for. 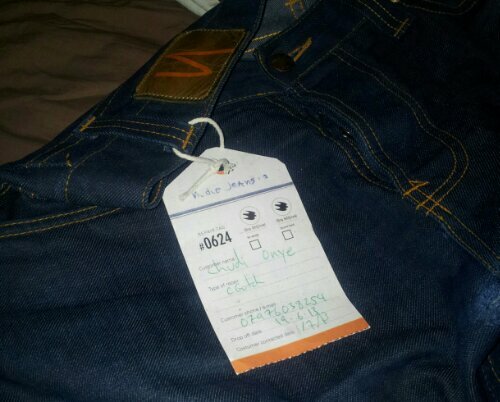 My first experience with Nudie Jeans was in December 2007, when I purchased a pair of their jeans. The fit, styling and look were so good. So much so that I wore them until they wore out. I never forgot how good the jeans were, and held that experience ever since then. Fast forward to December 2011 (4 years later, in which a World Cup and European Championship happened between that time and Spain finally came of age), and I needed to buy some jeans. In that period I went through numerous brands of jeans, from 55DSL to ASOS, which were alright but never quite met the standard set by Nudie. So I decided to purchase another pair of Nudies which have served me well up to this point. Upon this discovery, I realised that I can not only restore my jeans back to their former glory, but also feel confident in the knowledge that purchasing a future pair of jeans from here is ‘guaranteed’ from damage caused by wear and tear. It felt like the warranty that you get when purchasing expensive electronics or a brand new car, but for denim? This is a whole new concept. So today, I brought in my damaged denim, left my contact details with the shop assistant and now await my newly restored jeans. This is me expressing how a little thoughtfulness and understanding from a brand and the way that they deliver their after sales service can go a long way in developing loyalty and create stories from the whole experience. From Nudie creating quality denim to offering a repairs and adjustment service to add value to my purchase, they have gained a lifelong customer who will spread the word about the Nudie experience without being paid to do so. 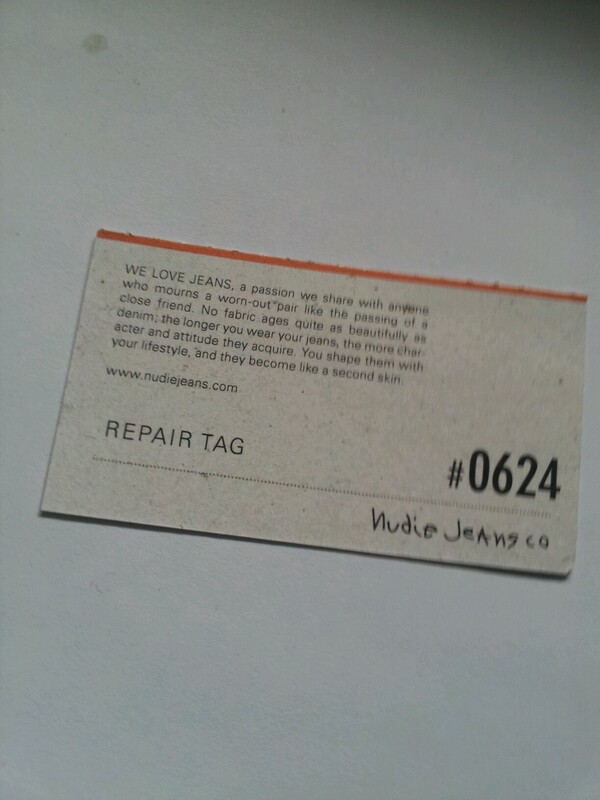 If you own a pair of Nudie jeans that need repairing, or want to purchase a pair, pop down to their repair store. This is a journey where the walk doesn’t seem so tiring because of the understanding we have built up along the way. Share your thoughts with me at @ChuxOnye on Twitter. This entry was posted in Branding, Marketing Communication, PR and tagged After Sales Service, Brand Experience, Brand Loyalty, Denim, Fashion, marketing, Naked, Nudie Jeans on June 19, 2013 by Chux.